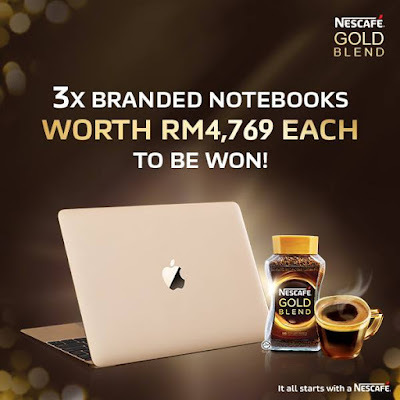 Home » Facebook » lucky » lucky draw » Nescafe » purchase » spend » NESCAFÉ Gold Blend Contest : 3 branded notebooks worth RM4,769 each, and more prizes to be won! NESCAFÉ Gold Blend Contest : 3 branded notebooks worth RM4,769 each, and more prizes to be won! Purchase any of the following participating NESCAFÉ® GOLD BLEND products worth a minimum of RM15 and above in a single receipt from any participating GIANT, Mercato, Cold Storage or Jasons Food Hall outlets in Peninsular Malaysia only, during the Contest Period. Submit Contest entry or entries by keying in your name, MyKad number, mobile phone number and the POP invoice number and selecting the quantity and weight of the NESCAFÉ® GOLD BLEND product purchased, in the Contest Facebook app. Keep your receipt for verification purpose if you are selected as a winner. Visit NESCAFÉ Gold Blend Contest for more details.